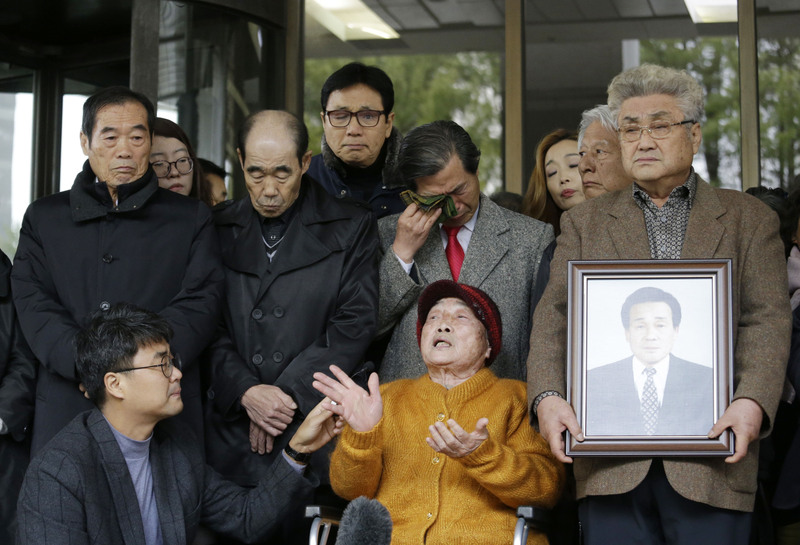 The diplomatic crisis between Seoul and Tokyo deepened further Thursday as two South Korea courts ordered two Japanese firms to pay compensation to South Korean wartime laborers. Experts and diplomats say there has been a huge gap in perception between the two nations over the labor issue, resulting in apparent confusion over the usage of relevant terms. What is the wartime labor issue in the first place? Facing an acute labor shortage because of the Sino-Japanese War and World War II, Japan systematically brought in a massive number of male workers from the Korean Peninsula — ruled by Japan at the time — from 1939 to 1945. After the wars, South Korea demanded compensation for laborers who claimed they were forced to work in Japan under harsh conditions, typically those who worked at coal mines. After marathon negotiations over the span of 14 years, the two countries agreed in 1965 to settle all post-colonial compensation issues, including the one involving wartime laborers, by concluding a key economic cooperation pact. It was attached to the bilateral basic treaty that normalized postwar relations between the two countries. Under the lump-sum pact, Tokyo extended massive “economic cooperation” funds to the South Korean government and Seoul was in return obliged to pay any compensation money to individual wartime laborers through the use of the funds. 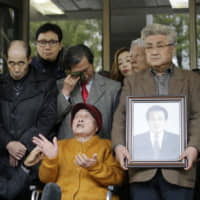 Many wartime laborers in South Korea, however, have for years demanded direct compensation from the Japanese government. Nearly a month before Thursday’s rulings, the South Korean Supreme Court upheld a lower court ruling ordering Nippon Steel & Sumitomo Metal Corp. to pay about ¥40 million in compensation to four South Korean wartime laborers. Under international law, South Korea is obliged to observe the 1965 pact. Why did the Supreme Court bypass the agreement? The Supreme Court claimed Japan’s 1910-1945 colonial rule was illegal and the pact did not deny the individual right of ex-laborers to demand “consolation money” for their suffering under colonial rule. Tokyo has, meanwhile, claimed its annexation of Korea was legal under international law at the time and that laws and decrees used to introduce wartime labor were likewise valid. The 1965 deal was one of the essential foundations for the two countries to normalize their postwar relationship, and all the South Korean administrations of the past — including that of incumbent President Moon Jae-in — have agreed that the wartime labor issue was legally settled as explicitly declared in the pact. Thus the Oct. 30 Supreme Court ruling “not only overthrows the legal foundation” of the postwar bilateral relationship “but also poses a serious challenge to the postwar international order,” Japan’s Foreign Ministry argued in a statement. How many South Koreans were brought to Japan during the war? Estimates by some notable Japan-based experts, including Fukuju Unno, professor emeritus of Meiji University, vary from about 700,000 to 800,000. Their estimates were largely based on an internal document compiled by a research group of the Foreign Ministry shortly after the end of World War II. The exact number of Korean wartime laborers, however, is unknown, as no official records to pin down the figure have been found. “We don’t have any figures. After more than 70 years passed (after the end of the war), it is very difficult to find out” how many individual workers were brought to Japan, a senior Foreign Ministry official in charge of the issue told The Japan Times. Were they all forced to come and work in Japan? No, although wartime Korean laborers are often categorically described as “forced laborers” by English-language media outlets. From September 1939, Japan started inviting applications from Korean workers, in particular those from southern rural areas, who wished to work in Japan on a voluntary basis. This recruiting system was called boshū (application invitation) in Japanese. Initially the government aimed to bring 85,000 Korean workers to Japan in fiscal 1939 alone. After the Pacific War started in December 1941, Japan faced an even more severe labor shortage. The Korean Peninsula meanwhile had fewer excess workers as Japan had recruited a large number from rural areas of the peninsula. Then in February 1942, Japanese government authorities got more involved in the active recruiting of male workers from Korea. This was called the kan-assen (government-coordinated) recruitment system. The government aimed to recruit 120,000 Korean workers in fiscal 1942. Workers that fell under those two categories were officially considered to have come to Japan voluntarily. However, in August 1944, Japan started applying its wartime compulsory recruitment system to Korean workers, called chōyō (requisition). Under the chōyō system, those who refused to work could be punished with imprisonment of up to one year or a fine of up to ¥1,000. Thus, those recruited through this system were forced to come and work in Japan regardless of their consent. So the workers recruited under the boshū and kan-assen systems were all voluntary workers? In reality, probably not. For example, some workers recruited under the boshū and kan-assen systems were later re-hired on a compulsory basis for an unlimited period by government-designated military-related companies, even though the working period for chōyō workers was officially set at two years. Some experts also say that some official documents of the Korean colonial government as well as a number of memoirs by officials and ex-workers suggest many were forcibly recruited against their will even under the kan-assen system. “Forcible recruitment was extensively conducted and it was recognized as a problem even inside the Korean (colonial) government and the Japanese government as well” in around 1943 or 1944 at the latest, said Masaru Tonomura, professor of modern Japanese history at the University of Tokyo’s Graduate School of Arts and Sciences. For example, an article carried by the official gazette of the Korean colonial government, dated April 13, 1944, admitted officials recruited Korean workers by force under the kan-assen system, Tonomura pointed out. The article in question read: “Studies into the reality of the worker recruitment under the kan-assen system show that (authorities) ignore the will of supposed work applicants and unthinkingly allocate target (recruitment) numbers to lower government bodies. Those lower bodies, in general, intentionally conduct forcible recruitment” of workers. What’s the confusion regarding these terms? Experts say that in South Korea workers recruited through any of the three official recruitment systems are often all described as either “chōyō workers” or “forced laborers.” Some argue many farmers in South Korea were so poor because of what they said was the brutal colonial rule by Japan that they had no choice but to come to work in Japan. Japanese media outlets, meanwhile, also tend to use the term chōyō to refer to wartime Korean laborers, although they know many workers were recruited through the boshū and kan-assen systems and were legally considered to be voluntary workers. This presumably added more confusion to people’s understanding of issues involving the recruitment systems. To avoid what it called terms that are “misleading,” Japan’s Foreign Ministry started using the term “civilian workers from the Korean Peninsula” when referring to wartime Korean laborers in general, ministry officials said.